You get what you focus on. So focus on what you want. - Steve Mehr. We all may have heard it, someone, saying “If you don’t understand where you are going, any road will not get you anywhere ” The outcomes we accomplish – wicked, ideal, great or notable – depending on what we focus on in each moment. Focusing our time, energy or money on the wrong things will not help you to have great accomplishments of your goals that is something we can’t bear to do. We should know what we are focused on each and every moment of life. Most of the people don’t even know what they want from life. They don’t have self-motivation to do something. When we are thinking of disappointment, stress, or any other disempowering action those are actually freezing our thoughts, and we are not focused on what we want. Sometimes we are thinking about the money we don’t have and the libations we have to make, that time we are focused on what we really don’t want. If we are focused on what we don’t want, that is all we see, and our thoughts and decisions are based on what we don’t want. If we know what we want, we present ourselves with the ability to imagine new opportunities, new motivations and create ideas on how to be get done the kinds of stuff and what to do or say in each moment to make it a reality. Make it more meaningful and practical. Do it now. Stay Motivated. We hope guys you find Quote "You get what you focus on. So focus on what you want. 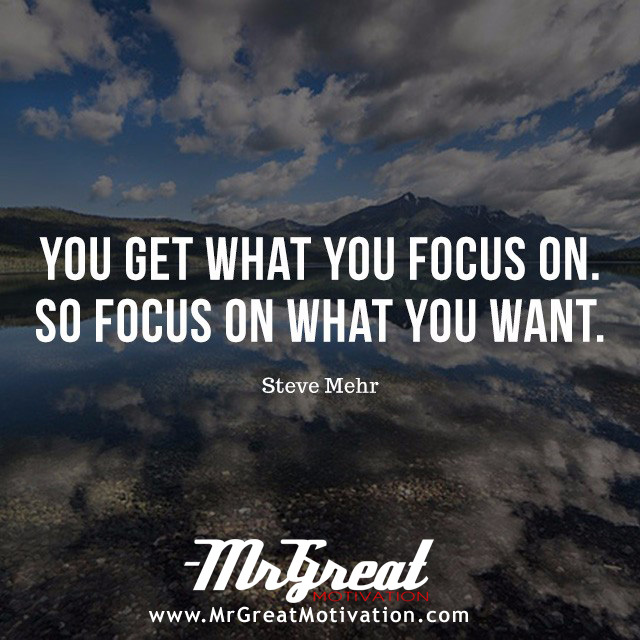 - Steve Mehr by Mr Great Motivations useful. If you think we have made some efforts, then don't forget to appreciate us by sharing this Quote with your friends and family, And thanks for visiting.